Our fourth day began at 9:30 a.m. with singing birds, sunshine, a cloudless, blue sky and a cool, gentle breeze. We ate bagels with peanut butter for breakfast and then repacked all of our supplies. A boyfriend and girlfriend walked past as we were getting ready to leave and asked if they could use our site for a short break. They had begun their day at McCargo Cove and were going down to Lake Richie as well. We talked for a few minutes before finally heading out at 11:20 a.m. One thing I have noticed over the years is that 99% of the people you encounter on the trail are very polite and pleasant to speak with. The conversations and experiences with other hikers make the trip even more enjoyable and those memories are just as vivid and long-lasting as encounters with the great scenery and wildlife. We retraced yesterday's path into the camp area, in reverse, and once again were standing on the open ridge of the Greenstone, high above much of the rest of the island. We headed south on the Indian Portage Trail from its junction with the Greenstone Ridge Trail. It wasn't long before we came upon Lake Livermore, a long, thin, shallow-looking lake just off the trail to our left. We stopped here for a short break and then continued south. The Indian Portage Trail was quite different from the Greenstone because we were much lower in terms of elevation, trees and vegetation were closer to the trail, the terrain was more muddy and rocky and there were quite a few trees down over the trail. I assume the latter was true only because trail crews had not yet managed to clear that section of trail. Today's hike continued with the familiar sight of moose and wolf droppings on and around the trail, sans animal sightings. 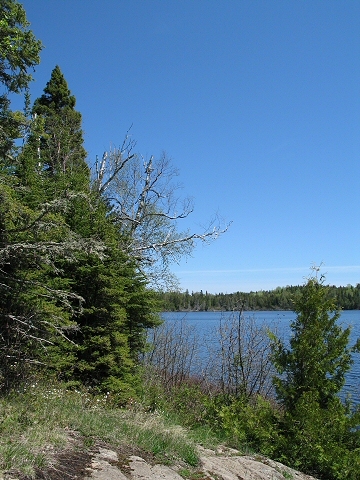 Much of the Indian Portage Trail passed through large stands of sweet-smelling cedar and spruce tree forests. The temperature probably reached 75 degrees today and the fact that we were "buried" in thicker tree cover and were at a lower elevation meant there were very few breezes to cool us down. 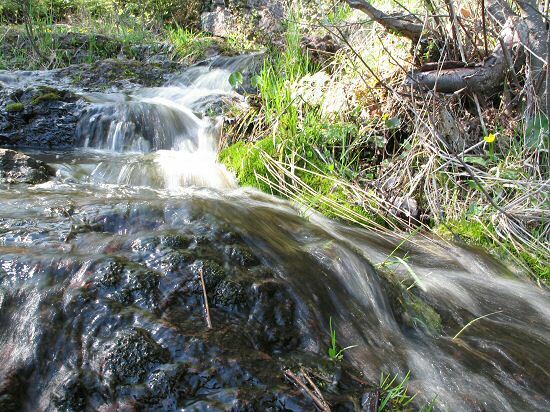 The lower elevation also provided more locations for water to collect and create swampy areas, which in turn meant more planked sections of trail than on top of the Greenstone Ridge. The vegetation was also much closer to the trail than it had been on previous days making the feeling of isolation that much more vivid. There were quite a few planked sections between West Chickenbone and Lake Richie but I counted seven that were quite substantial in length. I couldn't help but feel bad for the trail crews that have to haul those huge pieces of timber from the lumber drop out into the field where they then have to build the walkways that we usually take for granted. We only passed one other hiker on the trail today, somewhere between West Chickenbone and Lake Richie, but we didn't stop to speak with each other. At 12:50 p.m. we caught our first glimpse of Lake Richie from up on a ridge at the north end of the lake. 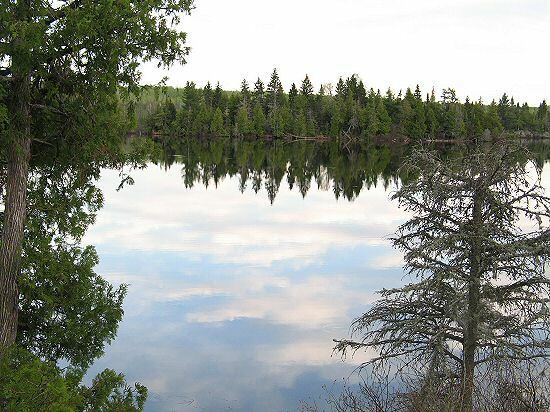 It is a big body of water that's surrounded on all sides by thick forests of spruce and cedar. The sun was high overhead by now and that really helped bring out the brilliant blue color of the water and the deep green color of the trees and vegetation. From this point we were only 15 minutes away from the campsites. When we arrived we discovered individual sites #3 and #4 occupied by pairs of hikers and two group sites already occupied. Site #2 was situated at the top of a rocky hill that was surrounded by trees and looked down over the lake below. The boyfriend and girlfriend we spoke with at West Chickenbone arrived at 1:50 p.m. in time to get the site next to ours as those hikers were getting ready to leave in their canoe. They began to set up camp but quickly took it down again. We thought they were going to move to another site but they said the bugs were too bad and they had decided to press on to Moskey Basin with the hope of securing a shelter. This campsite had a little of everything when it came to annoying creatures. There were mosquitoes, black flies, bees, horse flies and gnats and boy were there a lot of them! It didn't matter if we were up by the tent, sitting on the rock or standing down by the shore, we practically were carried away by the bugs. It wasn't long after the tent was set up and the backpacks unloaded that I realized how bad the bug situation had become so I quickly located my headnet and put it on. We've carried mosquito netting since the first trip and it has definitely been a life saver; I really pity the person who takes a trip without one. I sat on the rocky area at the base of the hill and wrote in my journal for a while and after that tried some fishing but never got a bite. The weather had been nice today even though it was a bit on the warm side and there was enough sunshine for me to get a sunburn on my right arm and the back of my neck. There was a constant breeze coming southeast across the lake that became stronger as the afternoon wore on. Even though the breeze didn't deter the bugs the cool air at least felt nice after a hot day of hiking. It was supposed to get down to 47 degrees tonight and tomorrow was supposed to be mild with a chance of showers which I hoped would once again hold off until we reached a shelter at Chippewa Harbor tomorrow afternoon. We cooked up a package of Pasta Primavera for dinner and were dining on the rocks by 7:00 p.m. as we relaxed and enjoyed the beauty of God's creation all around us. The noodles, cheese sauce, broccoli, zucchini, peas and red peppers could not have tasted better if we had been at a five star restaurant; Mountain House® meals have always tasted freshly made. After dinner we went fishing again at various places along the shore. Two couples from one of the group sites caught a few pike near the weeds at the northeast corner of the lake but somehow we did not manage to get even a single bite. When I got tired of catching nothing but weeds I walked back toward the campsite. Along the way I met up with a man, his wife and his sister who were here together on a trip. 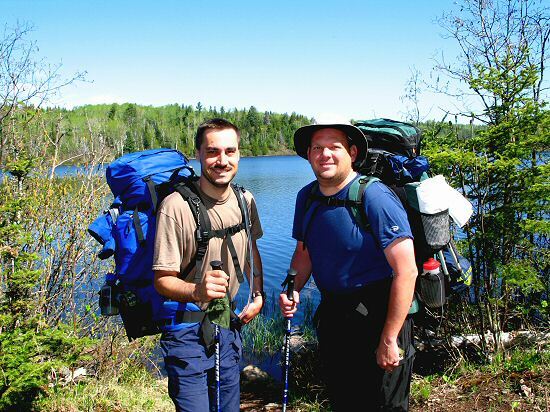 They take one hiking trip together every year and this time they chose to hike at Isle Royale. They were nice people and we stood on the trail talking for quite some time. By 9:00 p.m. we found ourselves back at the campsite where we ended the day sitting on the rock at the bottom of the campsite, talking and swatting at bugs which were just as tenacious now as they had been earlier. By this time the breeze had all but vanished and the lake was as calm and reflective as a sheet of glass. We watched a few Common Goldeneyes cruising through the sky over the lake and finally went to bed around 10:15 p.m. Final count for the day: 10…35…80… no, actually, several thousand bugs, several Common Goldeneye ducks, a couple turtles, a couple pike (unfortunately caught by other people), more hikers than we had seen all the previous days combined, and by far, the most picturesque views of the trip to this point.